Every year since 1990, the first day of winter and the longest night of the year has been marked as National Homeless Persons Memorial Day. This year, that day is Dec. 21. Sponsored by the National Coalition for the Homeless, it is an occasion to remember those who have died preventable deaths while experiencing homelessness and those who continue to suffer from lack of access to permanent housing. Vigils, marches, and memorials are taking place all across the country today and tonight to not only honor those who have lost their lives on America's streets, but also raise awareness of the plight of homelessness in the country. Though National Homeless Persons Memorial Day has been observed annually for 26 years, many have only heard about it for the first time this and last year thanks to social media and the #HomelessMemorial hashtag on Twitter. There are a number of organizations and individuals fighting tirelessly to make sure homelessness in America ends sooner rather than later. Still there is so much more awareness that needs to be raised before that mission can be fulfilled. Here are just a few facts to keep in mind as the country observes National Homeless Persons Memorial Day this year. Despite the fact that hundreds of thousands of Americans live without permanent shelter for some amount of time each year, this isn't something that we as a country must settle for. 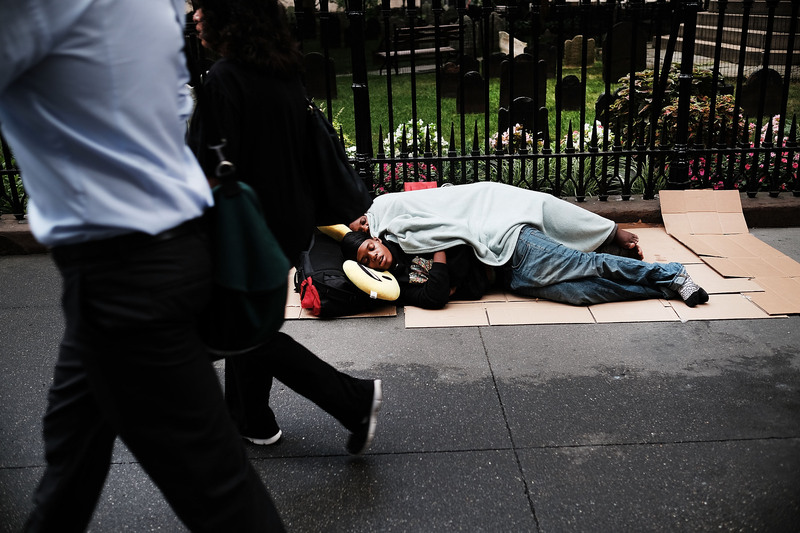 As the National Alliance to End Homelessness writes, the type of homelessness we see today is the result of the movement of deinstitutionalization and decreased spending on affordable housing that started in the late 20th century. With increased spending on low-income housing, homelessness in America, and the suffering of those experiencing it, could be greatly reduced. There is no federal database currently tracking eviction rates in the U.S., but according to data recently released by real estate company Redfin, eviction rates rose 37 percent between 2001 and 2015 with 2.7 million people having faced eviction last year alone. Additionally, from 2000 to 2015, rents across the country rose 66 percent, while incomes only rose 35 percent. According to the National League of Cities, an estimated 2,675 people died while living without permanent shelter this year, each of them someone's friend, parent, or child. Simply put, this number is unacceptable. Redfin's new report also reveals that one in four Americans spent half or more of their income on rent last year. With that in mind, many of us are one lost job or one medical emergency away from being on the streets. And indeed, that is what happened to so many of the thousands of people experiencing homelessness right now. Moral judgements are often directed at those forced to sleep on the streets, but those couldn't be further from the truth of the situation. Despite what many stereotypes about unsheltered individuals imply, homes aren't reserved for good people and denied to bad people. Rather, millions of Americans are vulnerable to losing their homes with thousands falling through the cracks every year. If this is your first time hearing about National Homeless Persons Memorial Day, take some time today to learn about homelessness in America and what you can do to help. On every day, though, treat people experiencing homelessness with compassion and respect. It's truly the least you could do.